The ceremony took place at the headquarters of the National Constituent Assembly. May 24 (teleSUR) Venezuelan President Nicolas Maduro took an oath that he would fulfill his duties to the constitution and carry out changes for peace and prosperity of Venezuela. after he won the May 20 elections with a wide margin with 68 percent of the vote. 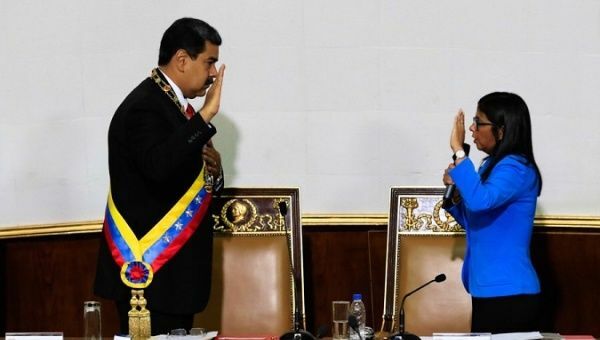 The ceremony took place at the headquarters of the National Constituent Assembly, or ANC, where its president Delcy Rodriguez approved a decree ratifying that Maduro had been re-elected and would assume his new period on Jan 10. After taking the oath, President Maduro addressed the crowad at the ANC where he thanked and welcomed all of those attending and the Venezuelan people for trusting him to lead the nation for another term. Maduro was elected for a second presidential term on May 20 winning 68 percent of the popular vote. While many heads of states in Latin America and the world congratulated the president, the United States and its regional right-wing allies chose to not recognize the results of the elections, with some governments refusing to acknowledge the election before it even started.